Punctures are, for a seasoned cyclist, a minor inconvenience. For those not yet initiated in the dark art of puncture fixing they can be a major issue – even putting people off riding alone and limiting their route options. It doesn’t need to be that way: with a little practice, learning to fix a puncture or mend an inner tube is easy. We’ve explained the easy steps in the video below, and there’s a picture guide that takes you through the steps underneath. However, once you’ve watched or read, make sure you spend some time having a go yourself. The only tricky element, really, is getting the tyre on and off the rim – and this simply takes practice. Though you could wait until a puncture strikes, and get your experience that way, it’s much easier to learn something new in the comfort of your own home – where the light is good, it’s not raining and you’re not cold. Check out the steps below, then dedicate half an hour to an hour to fixing imaginary punctures at home. That way, when the worst – or now, not so bad – does strike, you’ll be confident in your skills and ability to remedy the dreaded hiss. First things first: you need to remove the punctured wheel from the frame. If your bike uses quick release skewers, pull the lever to open it. You’ll need to let off the brakes: on caliper brakes, just open the quick release, or disconnect the brake wire if you have cantilever or V-brakes. If you have disc brakes you don’t have to do anything more than open the quick release skewer or thru axle to remove the wheel from the frame. Some commuter bikes uses wheel nuts – if this is the case, you’ll need a spanner – often 15mm – to loosen these off before you can remove the wheel. If it is a rear wheel puncture, adjust the gears so that the chain is on the smallest chainring on the crankset and the smallest cog on the rear cassette. This makes rear wheel removal easier. Undo the quick release lever or the wheel nuts and take the wheel out. Take off the valve cap (the little piece of black plastic over the valve) and unscrew the valve retaining nut (the round ring siting against the rim) if there is one. Push the end of the valve to fully deflate the tube if it’s not already empty of air. 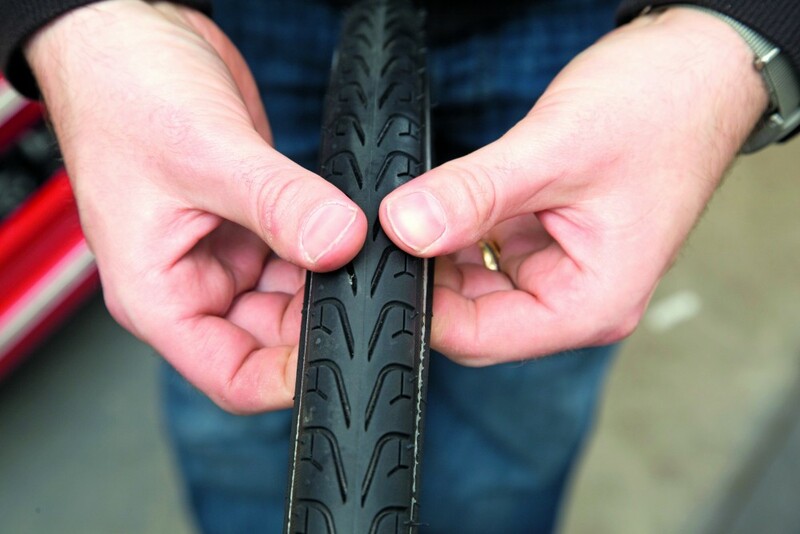 Check the outside of the tyre for any clear causes of the puncture. If you see any debris stuck in the outside of the rubber, remove it and make a mental note of where it is in relation to the valve. Bear in mind you might not find anything. Gently insert two tyre levers between the tyre and the wheel rim – directly opposite the valve (you can start anywhere but the further you are from the valve the easier it’ll be). 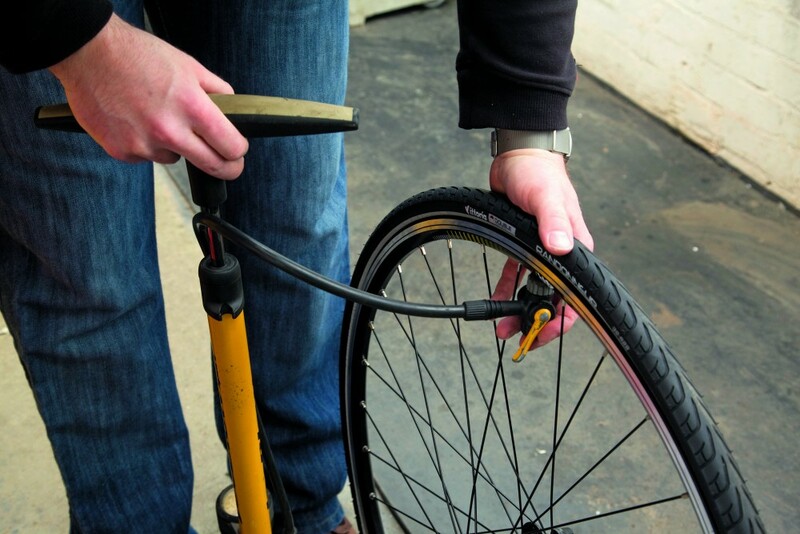 Pull the tyre away from the rim using the tyre levers, one at a time. If you have three levers, hook the first two under the spokes and remove some more of the tyre with the third lever. By now the tyre should be loose enough to simply run a tyre lever around the wheel rim to remove the rest of the tyre. With experience, you may only need one tyre lever. Pull out the inner tube and take the tyre off the wheel completely. Now, you’ve got two choices – mend the tube and replace it, or simply use a new one. It’s usually easier to use a new tube out on the road, then mend the punctured one when you get home – regardless what you decide, there’s instructions on how to mend a tube below, and either way the next steps are identical. Check that there are no further holes in your inner tube. Then carefully run your fingers around the inside of the tyre to check there is nothing else penetrating the tyre – if you find anything (small pieces of glass, thorns, gravel), remove it. Not doing so can result in the dreaded double puncture. It’s usually possible to make a visual check of the tread while doing this. Inflate the (patched or replacement) inner tube slightly so it just becomes round in shape. This helps stop it pinching against the rim when you put it back in. Refit the tyre on one side. Make sure the tread is pointing the right way — some tyres have arrows on the sidewall indicating the ‘direction of travel’. Some tyres are unidirectional and can be fitted in any direction. Put the valve in the valve hole, and feed the inner tube into the space between the tyre and the wheel rim. 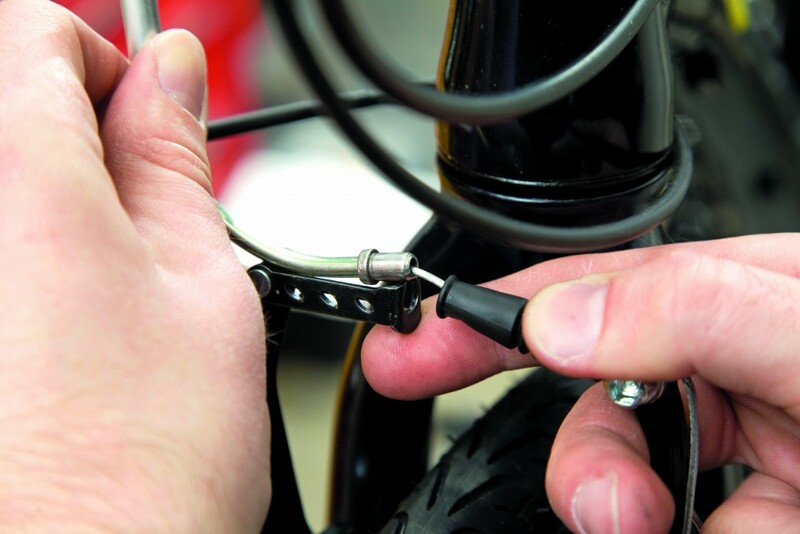 When the inner tube is all in, twist the tyre back into place, starting at the valve. Try to finish directly across from the valve as the tyre will be looser there. If it gets difficult, let a little air out of the inner tube. Check there are no bulges and that the tube isn’t pinching under the tyre bead. 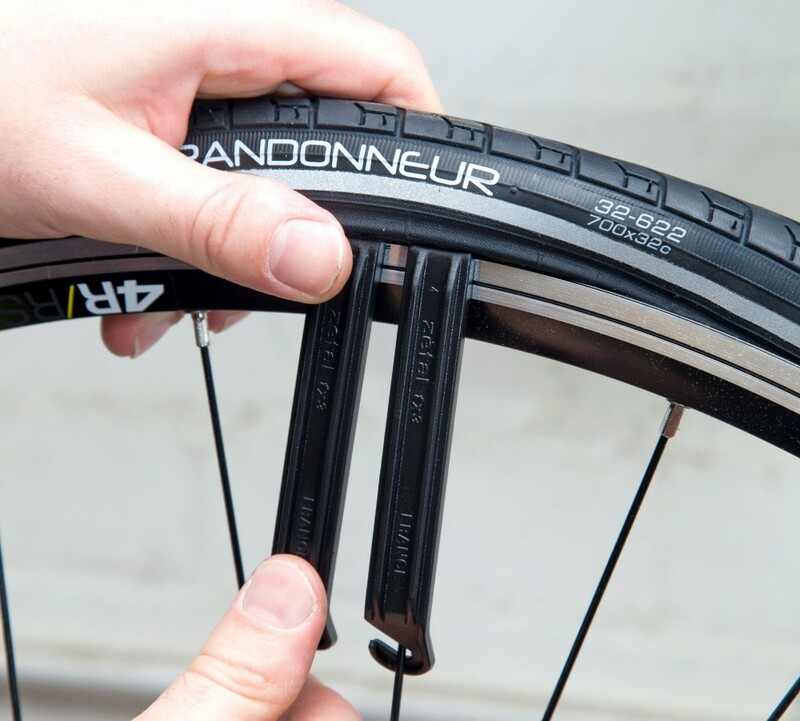 You can use tyre levers to help with the last section, where the tyre is tightest – but if possible avoid this as they can pinch the tube and cause you to have to start all over again. The tougher and newer the tyre, the harder this will be – by contrast well used, supple summer tyres are usually much easier to get back on the rim. 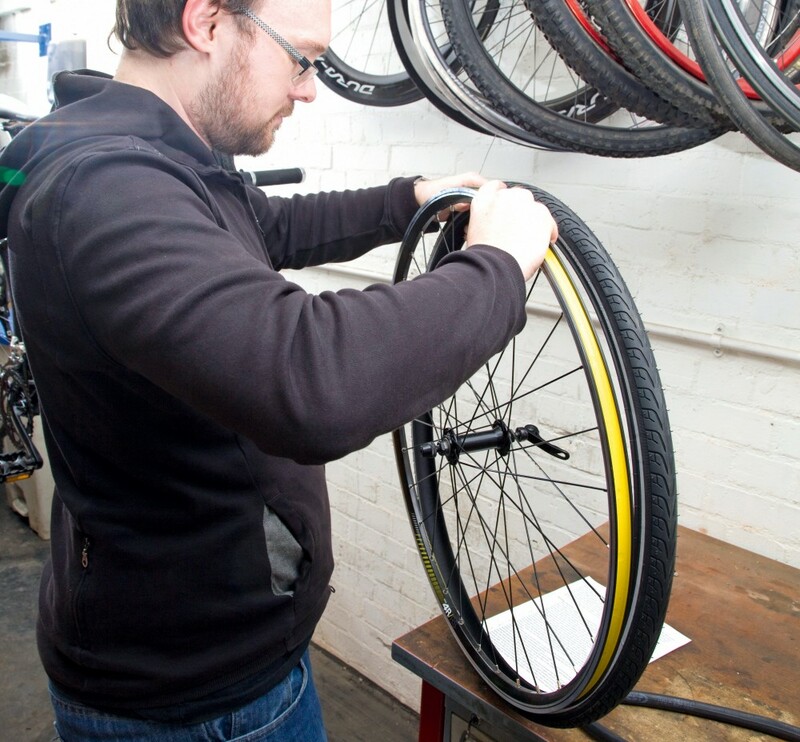 Pump up the tyre to the correct pressure and refit the wheel into the bike securely. Close the brake quick release lever or reattach the brake cable. If you have mended a rear wheel puncture, get someone to hold the bike up, and go through the gears. Check that the wheel spins freely and the brakes work correctly. 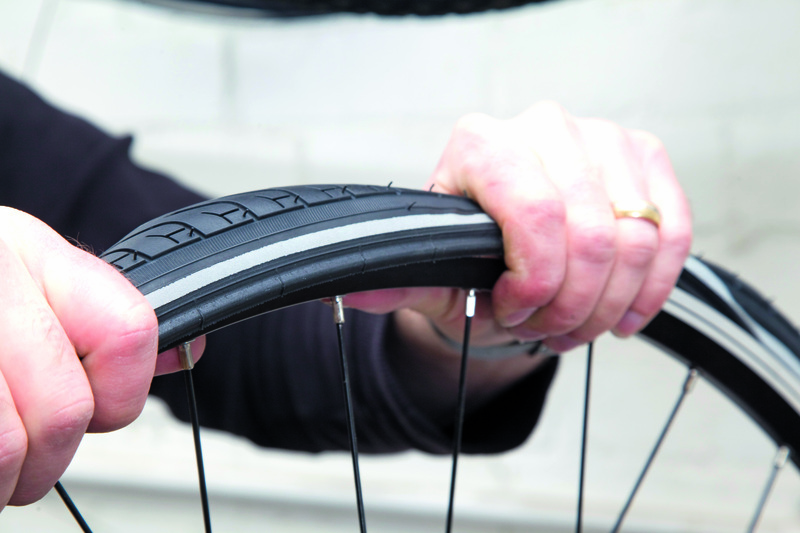 Inner tubes can be quite expensive, and they’re easy to fix so it’s a good idea to mend them instead of simply replacing one and chucking the old rubber. If the puncture is not obvious, pump up the inner tube. Once inflated, it is usually easy to hear the air escaping. If not, run the inner tube past your lips to sense the escaping air. Once located, roughen the area around the hole thoroughly with the emery paper in your puncture outfit. Apply enough glue to cover an area a little bigger than the repair patch that you’ll use. Do this a couple of times, allowing the glue to dry between applications. After the last application of glue, take a patch, remove the backing, and stick it on the inner tube. Press it home, working from the centre outwards. When you are confident that the glue is dry, carefully remove any further film attached to the patch. There are two types of valve with bike inner tubes: Presta and Shrader. A Shrader valve is the same as you’ll find on a car tyre and to inflate it you simply have to use a pump with a compatible adapter. To deflate it you have to push a little pin found inside the valve. Presta valves are thinner with a small captive nut found near the top. To inflate you need to unscrew the captive nut fully before using a pump with a suitable adapter. To deflate you unscrew the captive nut, then push it ‘in’ towards the base of the valve. Check your spare tubes have the correct valves and that they’re long enough for your rims. People often upgrade wheels to deep section rims, but forget to get new spare tubes with longer valves. 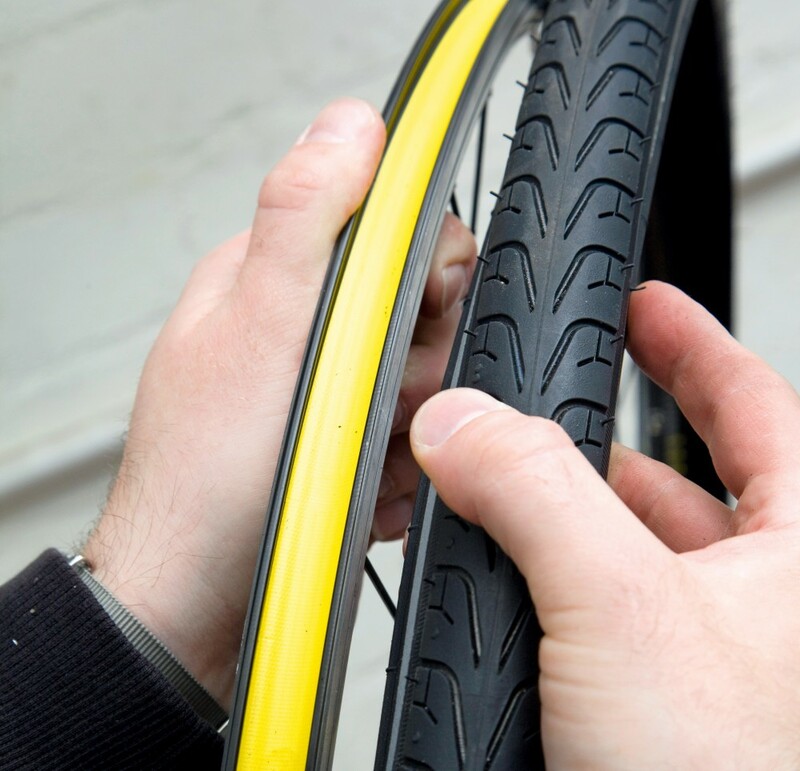 If you find you’re getting regular punctures, it’s a good idea to check your tyres are still in good condition and appropriate for the type of riding you’re doing. Choice of tyres is almost as important as the wheels or frame. First of all your tyres need to be the correct size to fit your wheels. They need to be pumped up the appropriate pressure — too much pressure will blow the tyre off the rim and too low a pressure will allow pinch punctures and tyre wall damage. It’s also best if they are the right tread for the surface that you are riding on, the time of year and what riding you’ll be doing. Tyres that are smooth because they are worn out are useless and dangerous. Tyres that have a series of tiny cracks in the sidewalls or between the tread blocks need replacing too. From time to time, a tyre may have some internal damage which results in a bulge somewhere around its circumference; this is another occasion when the only remedy is a new tyre. 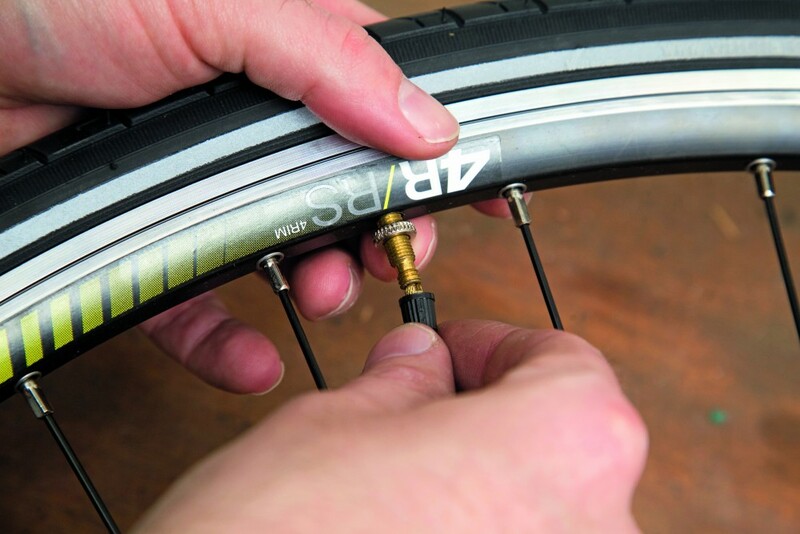 Finally, the inner tube: make sure any replacement inner tube is the right size for the tyre, and you have the right type of valve to fit through the hole in the wheel rim. See below for valve types. If the hole in the tyre is large, this may cause the inner tube to bulge through the gap, like a hernia. If this is the case, replacing the tube will just result in another puncture. The solution is to reinforce the hole, with an old piece of tyre from the inside. In desperate situations we have even seen energy gel wrappers used for this purpose. This solution should only be used to get you home or to your nearest bike shop: don’t ride on determined to hit your mileage target only to get more stranded when the tyre completely fails.